Hotel Transylvania brought us the story of a safe space for all monsters, a touching father/daughter relationship, and what happens when a vampire and a human fall in love. In the second installment, we welcome Dennis (or, of course, Dennisavitch), the half vampire/half human addition to the family. But, in Hotel Transylvania 3: Summer Vacation, we take a break from Mavis’ evolution, and bring the focus back to Dracula himself. After the death of his wife, Dracula (voiced by Adam Sandler) became completely focused on his daughter, Mavis (voiced by Selena Gomez), ensuring that she was raised with love and complete safety. Now that Mavis is married and a mother, it’s time for Dracula to move on. He’s lonely and needs companionship (and it’s clear that dating apps are not his best friend). Mavis can tell that Dracula is not being himself so, initially against his will, she takes the entire group on a cruise to the mysterious Bermuda Triangle. Clever location for a monster cruise, I thought. The film begins with a history lesson of sorts, as we get a glimpse of Dracula’s archenemy, Van Helsing (voiced by Jim Gaffigan). I’m sure you recognize this name. Van Helsing dates back to the original Dracula film of 1897 and has been featured in numerous novels and films over the decades. It seems only natural that the infamous vampire hunter makes some sort of appearance in the Hotel Transylvania trilogy. Although, perhaps, this might have been an easy story line to grab in order to extend the series. Personally, I found that introducing an archenemy in the more lovable Hotel Transylvania series gave it more of a ‘Despicable Me’ vibe. The entirety of this film has an overall theme of family legacy. (Though I’m not reaching very far for that theme – I mean, the cruise ship was even named ‘Legacy’.) Our pal Van Helsing is obsessed with the ideas of his great-granddaughter, Ericka (posing as the cruise director), capturing a weapon (the “family heirloom”), killing Dracula, and fulfilling the Van Helsing family legacy. However, the plot twists when Dracula ‘zings’ and falls head over heels for young Ericka. Initially, Ericka (voiced by Kathryn Hahn) runs with it, even going on a fake date with Dracula in an attempt to get closer to her supposed enemy. But as the film progresses, Ericka seems to see something more in Dracula, and we see her struggling with these conflicting feelings. The love story between Dracula and Ericka is very Romeo and Juliet, portraying them as star-crossed lovers unable to be together because of their feuding family past. We see an interesting role reversal with Mavis and Dracula. All of Mavis’ life, Dracula has protected her, and was very concerned when a love interest came on the scene, especially a human! Though, in Hotel Transylvania 3, Mavis becomes very concerned and protective of her father when he begins his relationship with Ericka. Mavis immediately senses that she’s trouble. And, interestingly, Dracula also falls for a human. Finally, we go out on a kind note as the evil Van Helsing is saved instead of destroyed, despite his plans to destroy Dracula. 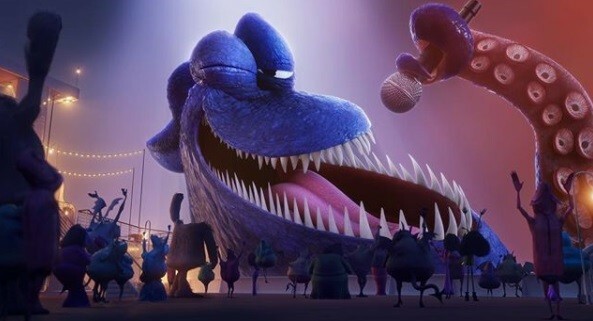 The lovable Murray (voiced by Keegan-Michael Key) put is so well: “You gotta be greater than the haters”.